Euro Motors Jaguar Land Rover announces the introduction of an unbelievable offer on the high performance Range Rover Sport V6 and V8 models. In line with its constant innovative practices for the utmost benefit of its customers, Euro Motors Jaguar Land Rover now presents the Range Rover Sport V6 and V8 with complimentary registration and deployable sidesteps. 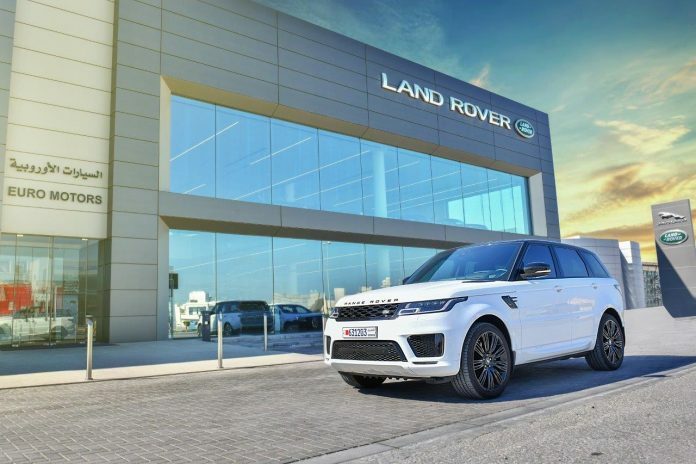 With the campaign set to run up until 31st March, Land Rover Bahrain is also offering free insurance for customers purchasing the Range Rover Sport V8 model. To complement the offer, customers are additionally provided with unparalleled benefits such as 5 years free warranty, a free 5 year service package and free 24/7 road assistance services for 5 years. Exceptional grip and steering confirms Range Rover Sport as one of Land Rover’s most dynamic SUV. With a suite of carefully engineered technologies it delivers an exhilarating drive, whatever the road and conditions. The Range Rover Sport’s presence is more formidable than ever. With its distinctive silhouette, rearward slopping roof and continuous waistline, Range Rover DNA is unmistakable throughout. Providing the choice of enhanced refinement and comfort or performance, the optional Configurable Dynamics allows one to configure the vehicles throttle mapping, gearbox shift points, steering settings and suspension to suit their needs. Meticulously designed, The Range Rover Sport provides its owner with a spacious cockpit that is created around the driver.